Large, flexible protected territories with freedom and referral rich mapping differentiates our senior home care franchise opportunities from our industry competition. Factor in the reasonable start up costs and senior home care franchise opportunities from Visiting Angels and you'll find we are the only franchised organization that offers so much reward for such a small investment. When your business depends on bringing your service directly to your clients’ homes, territory matters. But when you work with a franchise system that includes protected territories, that can sometimes unfairly limit your ability to reach clients. That’s why Visiting Angels has created a protected territory system that offers protection and flexibility to our elderly care franchises, ensuring franchisees see the best of both worlds. 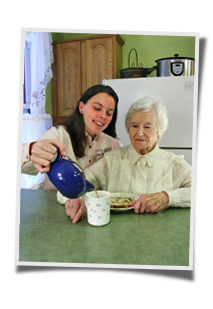 As a Visiting Angels elderly care franchise owner, you will have full and direct access to your market’s entire metro area. Our territories are expansive, covering 200,000 people — but as a Visiting Angels elderly care franchise owner, you will be able to do business with clients outside of your territory’s limits. This sets Visiting Angels apart from other elderly care franchise systems, many of which require that franchisees purchase multiple territories if they want to expand their base of potential clients. Instead, Visiting Angels offers a unique protected territory system that ensures you only ever need to purchase a single franchise. Visiting Angels elderly care franchise owners have the territorial flexibility they need to grow their business — but they also receive the protection they need to ensure their business is secure. At Visiting Angels, we know that franchisees succeed by supporting one another and respecting one another’s bounds. By acquiring a protected territory from Visiting Angels, you can rest assured that you will be the sole voice and provider for the Visiting Angels brand in that territory. For more information on how the Visiting Angels protected territory system operates, get in touch with our team to speak with a corporate representative. If you’re an entrepreneur hoping to open your own elderly care franchise, it’s important that you select the territory that’s right for your business. At Visiting Angels, our corporate team has decades of combined experience in the elderly care franchise business, and we are happy to help you identify strong territories where you can set up shop. Our experts can help you recognize regional demographics and trends, and we’ll provide you with all the guidance you need to start an elderly care franchise in the territory of your choosing. Find out how you can start your very own elderly care franchise by requesting information on Visiting Angels opportunities today.